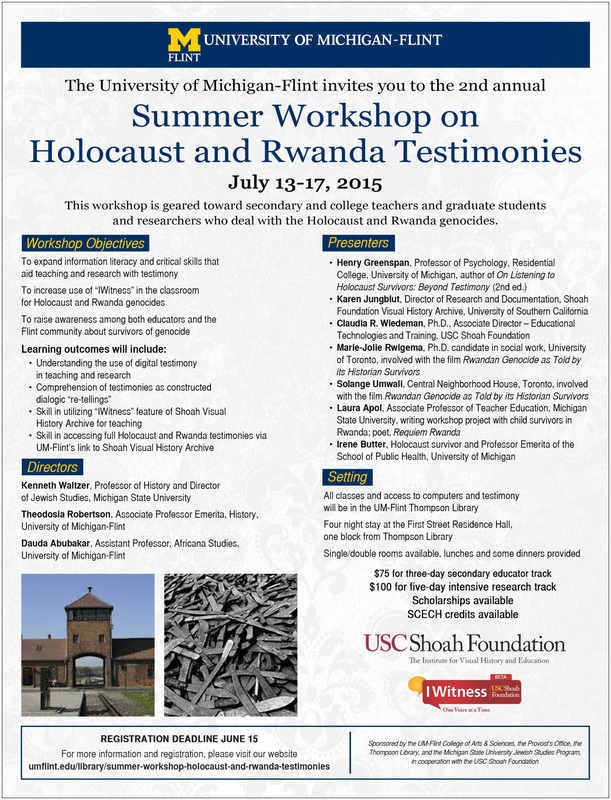 This summer the University of Michigan-Flint will host a workshop focused on using Holocaust and Rwanda genocide testimonies in research and education. The workshop objectives include expanding information literacy and critical skills that aid teaching and research with testimony; increasing use of iWitness in the classroom; and raising awareness among both educators and the Flint community about survivors of genocide. All classes will be held in the UM-Flint Thompson Library; participants will have access to computers. Lunches and some dinners will be provided. Cost for the three-day educator track is $75; cost for the five-day intensive research track is $100. Scholarships are available. Overnight accommodations are available in our dorms. Registration deadline is June 15. Visit go.umflint.edu/testimony. To register, or for more information, visit the Summer Workshop website. If you have questions, email ENewberr@umflint.edu or call (810) 424-5302.